MANILA, Philippines - The September 2017 Real Estate Appraiser board exam results, which include the full list of passers, top 10 (topnotchers), top performing school and performance of schools are all available on this page as officially released on Wednesday, September 20 or in 3 working days after the exam. As announced, 555 out of 1,501 passed the exams. The Professional Regulation Commission (PRC) conducted the Real Estate Appraiser board exam on Friday, September 15, in the cities of Manila, Cagayan De Oro, Cebu, Davao, Iloilo, Legazpi, Lucena, Pagadian, Tacloban and Tuguegarao. "All registrants are likewise required to submit an original copy of Surety Bond for three ( 3 ) years (with certificate of good standing from the Insurance Commission), minimum amount of which is P 20,000.00, with the Professional Regulation Commission (PRC) as Obligee. For government employees, no Surety Bond is required, but instead, submission of a notarized original Certificate of Employment showing that such appraiser license is an eligibility requirement of his/her employment from their respective offices." Real Estate Appraiser board exam's verification of ratings (passers, non-passers and removal) can be done online. Results of the recent Real Estate Appraiser board exam are expected to be released online in two (2) to three (3) working days after the exam. In the same period last year (August 2016), PRC named a total of 20 out of 27 passers. The results were released in 3 working days. Meanwhile, 12 out of 16 successfully hurdled the June 2017 Real Estate Appraiser Licensure Examination. Results were announced in 2 working days. 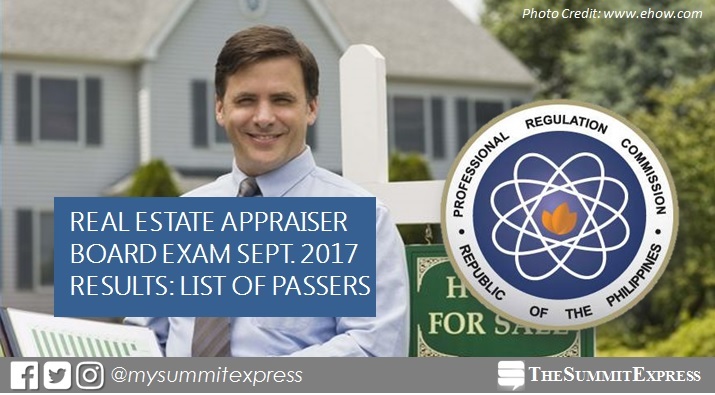 Monitor this page for the real-time updates on Real Estate Appraiser board exam results. Check out also the official website of PRC for more information.